Follow these instructions and your furniture will look great for many years to come. Place a large drop cloth where you intend to do the sanding. If it's possible to work outside you'll find the clean up much easier. Gently sand all areas of the piece. Don't rub too hard as you don't want gouges or flat spots where they don't belong. 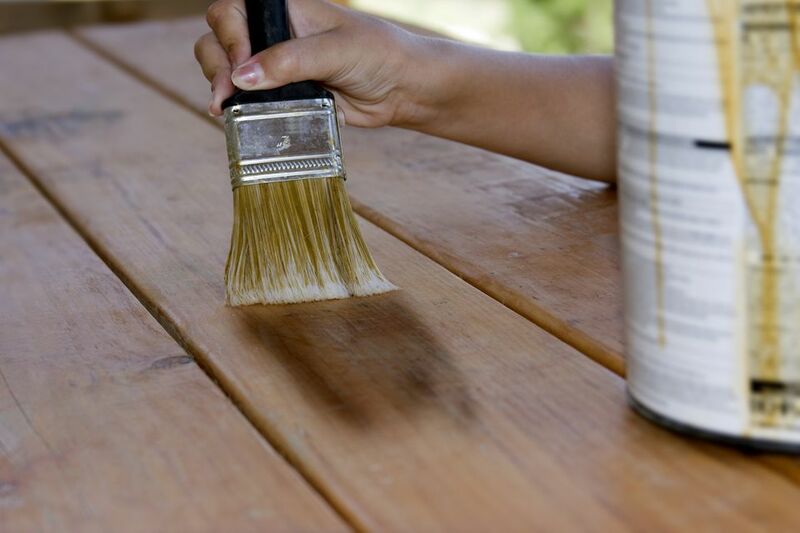 If you're sanding a table, you can use a power sander with fine-grit sandpaper for the flat surfaces. For chair spindles, use a foam sanding block. It will allow you to curve around the found spindles. Wipe down the piece with a damp lint-free cloth to remove any excess dust, then wipe again with a dry cloth. Place the piece aside until you're ready to stain. Lay a sheet of plastic on the floor before you start staining. Lay some newspaper over the tarp to provide an absorbent layer for stain drips. If you're working on a large piece, use chunks of wood to raise the piece off the floor. You'll be able to stain all around the bottom and legs and save your back in the process. Mix the stain well before opening. Then, stir the stain with a paint stick until it's completely mixed. Pour about a half inch of stain into a paint tray or shallow pan. Continue to stir and mix the stain as you're working to be sure that the color is even throughout during the whole process. You will need to work in sections as you apply the stain. Turn the piece over and do the bottom first. Stain, wipe off the excess, then move on to the next section. Do the most noticeable areas last. That would be a table top, the topside of a chair, a desk writing surface. This is probably the most important step of the whole process. By removing the excess stain, the grain of the wood will show through and give the piece character. You'll need lots of lint-free rags for this process. If you don't wipe down the stain the liquid will become sticky and you won't be able to smooth it. If the stain isn't dark enough, reapply another light coat, let it soak in, and wipe off again. For more information about staining and wiping down, check out the application tips on the can. It will take about 24 hours for the stain to dry completely. Set the piece in a dust-free area where it won't be touched. If you live in a very humid area, the drying might take longer. In a dry area, a shorter time. Rub your hand over the dry stained piece of furniture. If there are any rough or uneven areas, lightly sand them down, taking care not to remove the stain. Carefully wipe off any dust. Choose your final coat, whether it's wax or oil or polyurethane. Apply according to the directions on the packaging of your product. If the piece you own is a valuable antique you might want to consider having it professionally refinished. While staining isn't a particularly difficult project, it can sometimes take a few tries to get it looking the way you want. A costly antique can be devalued if it's not done right. That said, a second-hand piece that isn't particularly valuable can be made to look much better with a simple home staining job.